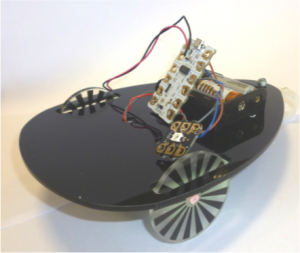 The programmable buggy project is intended to fulfil the requirements of the Design and Technology curriculum, to encourage students to create a product which utilises new technologies, to collaborate and problem solve, develop independent thought, and to enjoy the designing and making process. In pairs or small groups, students assemble and program a buggy to move along the floor of the classroom. Easy to operate software is used to program each buggy to follow a route or find its way through obstacles. In order to be successful, students need to work effectively as a team, use iterative design processes and test their problem solving skills. The kits can be used with KS2 and KS3 students, and provide scope for extension with the addition of sensors and switches to alter the speed of the motors and additional outputs such as buzzers and LEDs. Students need to consider design factors such as the distribution of weight on the chassis and the effect this might have on traction and manoeuvrability. Older students use processes including computer aided design and manufacture in the form of laser cutting to manufacture their chassis and wheels, and numeracy skills are put into practice when students are asked to design the size of their wheels and then calculate the circumference. This helps them to understand how far their buggy will travel on one rotation, helping inform their programming. The buggy project and resources are available to hire with full training given by DT staff to help fulfil the requirements at both key stage 2 and 3. If you are interested in how the buggy project can be used in your lessons at key stage 3, there will be a DT Symposium held on Thursday 16 June 2016. Please email info@ceta.school to register your interest. Please click here for further details about how the buggy project can help your school at key stage 2.